A man volunteers his time in the first world war and sees all of his companions killed. When a second world war is on the brink, he accuses the world of not learning and practices alchemy. The finale is some of the wildest, most intense, riveting terror ever filmed as corpses rise from graves. A princess is kidnapped, a fierce giant monster is on a rampage and flying witch-harpies attack a ship. Sound neat? It is. Special effects by Jim Danforth. Includes the uncut original version and the musical version. Audio commentary and original trailer. Triple Feature: JACK NICHOLSON CULT CLASSICS: THE LITTLE SHOP OF HORRORS/THE TERROR/HELL'S ANGELS ON WHEELS. CLICK IMAGE FOR DETAILS. JACK NICHOLSON DOUBLE FEATURE - THE TERROR (1963)/LITTLE SHOP OF HORRORS (1960). CLICK IMAGE FOR DETAILS. A historic stage production set to DVD on the life and monsters of Jack P. Pierce - the man who created the icon looks of the classic horror films of Universal. CLICK IMAGE FOR DETAILS. A princess is kidnapped, a fierce giant monster is on a rampage and flying witch-harpies attack a ship. Sound neat? It is. Similar in many ways to THE SEVENTH VOYAGE OF SINBAD (including star Kerwin Matthews) this made a big splash with ticket-buying monster kids of the 60's. Stars Boris Karloff. Repackaged episodes of THE VEIL TV show into a feature movie. CLICK IMAGE FOR DETAILS. A scientist is found dead...Chan is on the case. Charlie Chan (Sidney Toler) and assistant Birmingham Brown (Mantan Moreland) look into the homicide. CLICK IMAGE FOR DETAILS. Daphne du Maurier's twisted murder tale directed by Alfred Hitchcock. Stars the flamboyant Charles Laughton and Maureen O'Hara. Daphne du Maurier's twisted murder tale directed by Alfred Hitchcock. Stars the flamboyant Charles Laughton and Maureen O'Hara. Budget-line DVD classic. Stars Colin Clive and Virginia Bruce. The gothic romance with Colin Clive (Dr. Frankenstein in FRANKENSTEIN). Some great atmospheric creepy scenes too. CLICK IMAGE FOR DETAILS. Stars Orson Welles, Joan Fontaine, Margaret O'Brien, Henry Daniell, Agnes Moorehead and Hilary Brooke. A dark shrouded past history hail over a household in a secluded Victorian manor. CLICK IMAGE FOR DETAILS. Featured on the DVD Box Set are: GAMMERA THE INVINCIBLE (1965), WAR OF THE MONSTERS (1966), DESTROY ALL PLANETS (1968) and ATTACK OF THE MONSTERS (1969)! Natives flee into the jungle after being attacked by a swarm of vampire bats. A low-budget semi-documentary utilizing semi-acting with load 'o' stock footage of jungles. A slice of forgotten strangeness in the annals of film. The director of low-budget horror films of the 1950s-1970s. 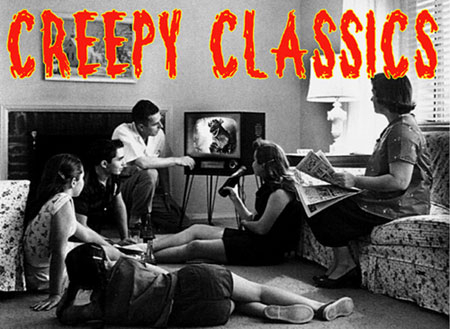 This collection features: MAN BEAST (1956), THE WILD WORLD OF BATWOMAN (1966) and CURSE OF THE STONE HAND (1964) which utilizes great spooky foreign film footage from the 1940s. Low budget filmmaker Jerry Warren triple feature: two Mexican horrors, dubbed in English: ATTACK OF THE MAYAN MUMMY (1964) and CREATURE OF THE WALKING DEAD (1965). Also, Warren's HOUSE OF THE BLACK DEATH (1965) starring Lon Chaney Jr. and John Carradine. Doc Frankenstein's grandaughter who's up to the bad business in a western town, when ol' Jesse James rides in. Directed by William "One Shot" Beaudine! CLICK IMAGE FOR DETAILS. It's Doc Frankenstein's grandaughter who's up to the bad business in a western town, when ol' Jesse James rides in. Directed by William "One Shot" Beaudine! Hosted by Joe-Bob Briggs. CLICK IMAGE FOR DETAILS. It's Doc Frankenstein's grandaughter who's up to the bad business in a western town, when ol' Jesse James rides in. Directed by William "One Shot" Beaudine! CLICK IMAGE FOR DETAILS. JOEL McCREA DOUBLE FEATURE - BIRD OF PARADISE (1932)/THE MOST DANGEROUS GAME (1932). CLICK IMAGE FOR DETAILS. Stars James Mason, Pat Boone, Arlene Dahl and Diane Baker. The Jules Verne tale of a professor and his student that have an incredible journey. CLICK IMAGE FOR DETAILS. Scott Brady stars in a journey through time - weird things in the future, dinosaurs in the past. Cool drive-in fodder! Also features Gigi Perreau, Anthony Eisley and newcomer Lyle Waggoner. Restored Classics Series from The Film Detective. An alternate earth is discovered in the exact opposite rotation as our earth. Two astronaut head that way to see what it's like. They crash land. Are they back on earth...or on the alternate earth where everything (including people) could be an exact replica...or are they?! Turns out the seventh planet is just like ours...or is it? Similar to Ray Bradbury's story "Mars is Heaven." But, as astronaut John Agar discovers, there are monsters behind ever corner. Extras include: commentary by Tim Lucas and trailer gallery. Midnite Movies Double Feature: INVISIBLE INVADERS (1959) and JOURNEY TO THE SEVENTH PLANET (1962). CLICK IMAGE FOR DETAILS. The feature film THE SAVAGE GIRL (1932 starring Maureen O'Sullivan the same year she debuted as Jane in the Tarzan series. Also 16 episodes of the SHEENA, QUEEN OF THE JUNGLE (1955) TV series that starred Irish McCalla. A great set with over 8 hours of jungle entertainment! Stars Buster Crabbe, Charles Middleton, Sheila Darcy and Vince Barnett. Buster Crabbe (Flash Gordon) is reunited with Charles Middleton (Ming the Merciless) in this junglet thriller. CLICK IMAGE FOR DETAILS. Johnny Weissmuller as Jungle Jim. Jim fights diamond smugglers who have aligned themselves with a nasty African tribe. The bad natives and smugglers try to drive a peaceful village of natives off their land. Johnny Weissmuller as Jungle Jim. Jim aids a reporter find a missing football hero in the jungle. There they run into a mad scientist, dinosaurs, skeleton men and a mad doctor (Lyle Talbot). Directed by Lew Landers (THE RAVEN). Johnny Weissmuller stars and leads people to find an ancient civilization in darkest Africa. There they discover race of ancient people and a moon goddess that is immortal. She is worshiped by pygmies called "Moon Men." Jungle adventure with Johnny! Stars Buster Crabbe and Ann Corio. A young woman raised in the jungle comes to the aid of two Americans trying to build an air field in Africa. The Nazis are out to stop them at any cost. Thrills and adventure, 1940s style.